In today’s episode Per Sjöborg speaks with Giulio Sandini, director of the Robotics, Brain and Cognitive Sciences department at the Italian Institute of Technology (IIT), about how he eventually came to study robotics after starting out as a vision scientist in the field of bioengineering. They talk about why interdisciplinary work is important to robotics, and how diverse teams of engineers, biologists, psychologists, mathematicians, physicists, and medical doctors can learn from each other; Sandini follows up with several examples of interdisciplinary success at the IIT including the iCub and COMAN humanoid platforms, the HyQ quadruped, and their work in rehabilitation robotics. Giulio Sandini is Director of Research at the Italian Institute of Technology and full professor of bioengineering at the University of Genoa. After his graduation in Electronic Engineering (Bioengineering) at the University of Genova in 1976 he was research fellow and assistant professor at the Scuola Normale Superiore in Pisa until 1984. During this period, working at the Laboratorio di Neurofisiologia of the CNR, he investigated aspects of visual processing at the level of single neurons as well as aspects of visual perception in human adults and children. He has been Visiting Research Associate at the Department of Neurology of the Harvard Medical School in Boston. 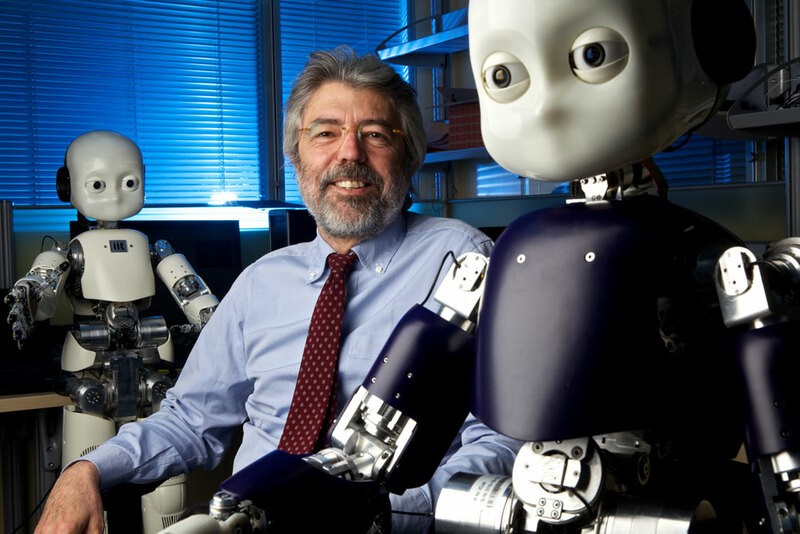 After his return to Genova in 1984 as associate professor he founded the Laboratory for Integrated Advanced Robotics. In 1996 he was Visiting Scientist at the Artificial Intelligence Lab of MIT. Since 2006 he is Director of Research at the Italian Institute of Technology where he has established and is currently directing the Robotics, Brain and Cognitive Sciences department. RBCS is a multidisciplinary environment composed of researchers with different backgrounds (engineers, biologists, psychologists, mathematicians, physicists, medical doctors) sharing “human centered” Scientific and Technological interests along three streams of research: Humanoid Cognition, Human Behavior and Biomechanics, Brain Machine Interface.